Isn't there any cost-free solution on how to rip a protected DVD on a Mac free for simply on-the-go convenience of watching on mobiles? Fortunately, you can still find a free DVD ripper Mac for copy protected DVDs. Just read below. Note: We in no ways advocate ripping protected DVDs for illegal use. You're allowed to copy and rip protected DVDs you legally bought for your personal use only, and you're suggested to refer to the copyright laws in your area before you do it. This free protected DVD ripper for Mac - MacX DVD Ripper Mac Free Edition works smoothly on macOS High Sierra, Sierra, El Captain an earlier macOS. The program is also the No.1 fast free DVD ripper Mac for copy protected DVDs with the support for multi-core CPU, super encode engine and hyper-threading technology guarantee. 5x faster DVD processing speed than other DVD freeware. Step 1: Insert the protected DVD into the computer drive and launch the free DVD ripper for Mac copy protected (if your Mac computer has no hard drive, get an external drive for Mac). You can freely add any protected or homemade discs. Then click the DVD button to load the disc. Step 2: The free ripper will automatically identify the correct title of the protected DVD and bypass any encryption on it. Then a window will pop up asking you to select an output file. There are popular profiles for MP4, DVD to MOV, M4V, MPEG4, and H.264 etc so you can copy DVD to hard drive to hold a safe backup, or watch the protected movies on iPhone, iPad, iTunes, Apple TV etc. Step 3: There are advanced editing options offered to customize the output movie. For example, you can trim the DVD length, add subtitles, capture your favorite part, crop and expand the video and etc. Then click the browse to set an output folder. Step 4: Check the boxes Safe Mode, High Quality and Deinterlacing to ensure the best quality. After all the settings, click Run. The free DVD ripper Mac for copy protected DVDs will start the ripping with a 5x faster speed. Note: While the freeware has the ablity to bypass most encryptions on the market, there are some out of its reach. If you're having problems with any protected DVD discs, there is a Pro version- MacX DVD Ripper Pro. It offers support for stronger protections, as well as wider output presets for latest devices and more options for digital files. There are some other free DVD rippers, maybe not that powerful, but they also feature the ability to copy protected DVDs for free. Below we introduce you three other free DVD converters for protected DVDs on Mac. Handbrake itself has no support for DVD protections, but with Handbrake libdvdcss, it will turn into be a free DVD transcoder for Mac to read protected DVDs and convert encrypted discs into MP4 or MKV. Its 1.0.7 version also has presents for 1080P, 4K 2160P, VP8, iPhone, iPad, Android, Windows phones & tablets built in. * It works across different platform. 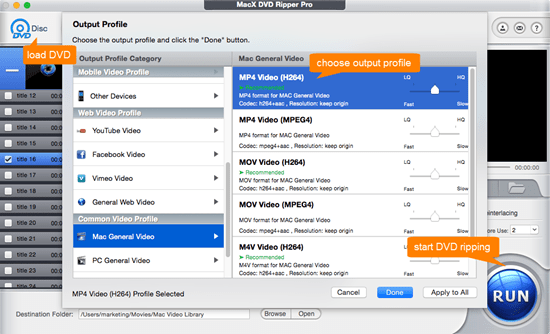 MakeMKV has an easy solution on how to copy a protected DVD on a mac freely. In addition to DVD discs, this free ripper also converts Blu-ray discs (note that the Blur-ray ripping function is only be free while it's in beta). The freeware converts protected DVDs into MKV files with fast speed, ranging from 30 minutes to hours. * The output MKV files have excellent quality. * Not stable (there are frequent MakeMKV down reports). Although its site is shut down due to legal issues, MacTheRipper remains an excellent free DVD ripper for Mac copy protected. Specifically, it supports CSS encryption, Macrovision protection, region code, and RCE region protection. Serving mainly as a DVD extractor for Mac, the program can only copy DVDs on Mac into DVD folder or ISO Image File. * It offers 1:1 DVD copy. * Incompatible with OS X 10.7 or later. Below is a table on some key factors that users care most on an excellent free DVD ripper with copy protection support. If you have ever ripped or copied a commericial DVD, copy protection is no strange to you. In the FULL DVD Review page, you can learn the whole story about DVD encryptions in detail. Here we will give you some basic must-knows. Currently, the main protection schemes used on DVD discs include Disney X-project DRM, Sony ARccOS Protection, Region Code, CSS, APS, UOP, CPPM, RCE, Analog CPS, etc. Some mix the correct title with multiple fake ones, like Dsieny 99-title shceme, some others embed corrupted sectors in the discs, like Sony ARccOS... All those measures are used to prevent software to read the disc for illegal purpose. Some free DVD rippers lack the abilty to remove protections will result in bad image quality, seveal KBs only, no video content or no audio... That's why it's hard to find a free DVD ripper that rips protected DVDs. As for the legality of ripping protected DVDs, it varies distinctly in different areas. In some countries like the US, it's not allowed to rip your own DVDs. However, it's widely considered as reasonable to rip legally purchased DVDs for personal use, like format shift for mobiles. But before you copy any protected discs, you'd better check your local laws. Best free protected DVD ripper for Mac - MacX DVD Ripper Mac Free Edition enables users to freely rip commercial DVDs with any protection & homemade discs to M4v, MOV, MP4 and more formats with high quality reserved. Copy Protected DVDs Freely on Mac - Rip 99% Encrypted DVDs!